Az eddigi legeslegjobb 1:1 iPhone klón! 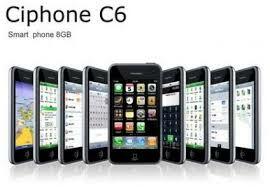 The Newest Version of Ciphone C6 - Ciphone C6a (version 2)! WiFi - Check emails, connect online, or surf the Web. Built-in GPS - Find your way anywhere. Touch Screen - Easy-to-use and responsive with smooth navigating. High Definition Camera – Take high quality photos with your phone! Connects to your PC for easy picture upload/downloading! Java Enabled - Get the latest cool Apps for your phone. Multiple Software Support – Run programs such as MSN, Excel, Skype. Smart Phone - Mobilize every part of your life! Smart phones have all the Apps you need to organize your business and pleasure needs.